Introduction: The Baptist Articles of Faith should be red and reflected upon from time to time, as suggested by passages like Titus 3:8. Today, we hope to discuss the first two Baptist Articles of Faith. We essentially believe that the Bible is authoritative truth. We understand that people were used in its writing. But we believe that God was involved in its writing and its translation in such a way that we have the best way to know God and His will for our lives, in the Bible. - II Peter 1:21 teaches that people were used to write the scriptures/Bible. However, God saw to it that His Word was written. II Timothy 3:16 teaches that God gave us the scriptures, so we can know what is authoritative truth in righteousness. As Baptist, we believe that all scripture is a reference to the 66 books that we have in our Bible, not other writings in other sacred books. Let’s make sure we study the Bible carefully, because it is God’s authoritative truth to us. - I Thessalonians 5:21 teaches the importance of testing all things. Everything that sounds good is not sound. We need to know the scriptures and test all things against the teachings of scripture, so we can know what to hold on to and what not to hold on to. Some things are supported by scripture, some are rejected by scripture, and some things are not mentioned in scripture. We should hold on to the first, reject the last, and use prayerful judgment in the second group. In summary, we believe that the Bible (i.e., scriptures) is from God through people and is authoritative truth. We essentially believe that there is only one God. Our God is the creator and ruler of the world. We owe Him all that we have. And we believe in the trinity. 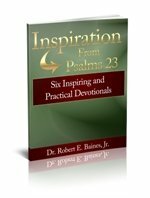 - Psalms 83:18 supports the idea that God is most high. Know that God is in a category all by Himself. - Mark 12:30 supports loving God with our all. John 14:15 teaches that love leads to obedience. Let’s love God enough to obey Him. - Matthew 28:19-20 supports the idea that God exists as the Father, Son, and Holy Spirit. By faith, not clear explanation, we say that there is one God who manifests Himself as the Father, Son, and the Holy Spirit at the same time and in different places. The holy Trinity is a faith statement more than anything that we can explain. In summary, we believe that there is one triune God who is the ruler of the world. We are to obey Him.